The mathematical and scientific approach to navigation and the development of the instruments used shared many characteristics to the development of scientific instruments. Optical makers supplied the lenses for telescopes as well as theodolites and levels, making the production of scientific instruments a natural progression. A G Lee and Son baragraph typical of the scientific instruments sold in our salerooms. Barometers and barographs are among the most common and popular instruments to be found at auction. 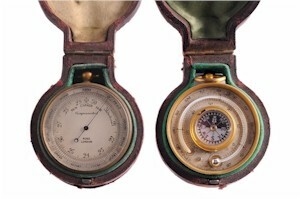 Small pocket barometers were developed in the early 19th century to be carried by gentleman travelling the countryside. These small pocket barometers were often embellished with the addition of a thermometer and compass inset into the gilt or gunmetal case, such as the example by Ross of London seen here. A gilt double sided pocket barometer and thermometer by Ross of London. 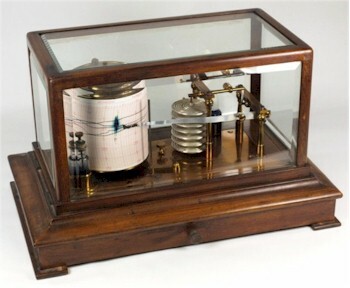 Many large houses had there own weather station or barograph upon which daily barometric readings could be taken. Once again, many of the more familiar makers such as Ross, Dent and Dollond produced barometers and barographs. These names also appear on many of the microscopes produced during the 19th century. The microscopes of the latter half of the 19th century are more precise instruments to those early examples of single tube compound microscopes. Developments in engineering enabled fully adjustable platforms and precise turning of objective lenses, leading to the distinctive form of the microscope we see today. Terrestrial and planetary globes were produced not only as aids to navigation, but also for topographical research and expedition. Drawing instruments used for cartography were also used in navigation and are often found in small sets or 'Etui', similar to small ladies needlework sets. Both again share common origins with marine instrument makers.